Beijing Xingpai Sports Development Co., Ltd.
Jiangxi Xingpai Sports Development Co., Ltd.
Jiangxi Xinghua Industry Co., Ltd.
Yushan County Tourism Investment and Development Co.,Ltd. The entry is open to all international men and women players (Hong Kong, Macau and Taiwan are included into this division). Chinese Women’s Division: Top 5—64 on the CBSA Chinese Pool Events Rankings for the year of 2018. If any withdrawal occurs in Stage 2 prior to the entry deadline, spot replacements shall be subject to the Event Organizing Committee. 7.1.1 The Organizing Committee will provide free accommodation of a twin bed room (including three meals a day) at the designated official hotels for all players during the tournament, players will only be required to pay for a deposit of ￥1000 upon check-in and will need to check-out on the second day after elimination. Players who may need a single room are required to inform the Organizing Committee in writing before the entry deadline and pay a deposit of RMB￥3,000/room upon check in. Players who request to stay in a room alone will have to pay the difference of RMB 300/day/room (approx. USD 50) Extra room fees for a single stay will be charged and deducted from the deposits upon check out. Players who choose not to stay in the official hotels will have to undertake the accommodation cost by themselves. 7.1.2 The entry fee for Stage 1 is USD100 or RMB 600 per person, and USD400 or RMB2400 per person for Stage 2. The players who will have qualified for Stage 2 from Stage 1 are required to make up the sum difference of ￥1800 as entry fees of Stage 2 to the event organizing party (Beijing Xingpai Sports Development Co., Ltd.) after he/she is qualified. A.Entry Deadline: Starting from the Official Rules of Competition published till 12:00 PM on Feb. 28th, 2019. Bank information to receive prize money. A.The Organizing Committee will arrange a reception team from 15th March 2019 at the HongQiao Railway Station in Shanghai to assist the international participants to transfer to Yushan, Jiangxi Province. Both international and Chinese players will be responsible for their own round trip transport costs from Shanghai to Yushan. All players will pay for their own accommodation if occurred during their transfer to Yushan. B.International players of Stage 1 are welcome to check-in at the official hotels from March 15th, 2019. The reception teams of the Organizing Committee will assist the players with their check in, help players pay for hotel room deposits and entry fees, and fill in the registration forms . Any international players not qualified to Stage 2 are welcome to continue to stay in the official hotels Free of Charge till March 21st, 2019 on the condition that they will have to show up at the Opening Ceremony on March 21st 2019. They will have to pay for the accommodation on their own if they continue to stay in the hotel from March 22nd 2019. All international players of Stage1 are required to arrive at Yushan and register before 12:00 March 17th 2019, otherwise any late cases will not be accepted. All international players auto-qualified to Stage 2 are required to arrive at Yushan and register before 12:00 PM, March 20th, 2019. Entry Deadline: Starting from the day that this Official Rules of Competition published till 12:00 PM on Feb. 28th, 2019. Players from the Chinese mainland need to confirm their entry by the deadline, otherwise their spots will be allocated to other players with lower rankings. Players who have confirmed their entry but don’t turn out in time will lose qualification next season. How to register and the registration fees: all Chinese players are required to register for the year of 2019 on CBSA App before March 28th 2019,. The registration fee is RMB100 /sport/person, it will be collected by the Tournament Office at the players Technical Meeting, otherwise participation will not be allowed. Entry Fees: The entry fee for Stage 1 is RMB 600 per person, and RMB2400 per person for Stage 2. Players qualified for Stage 2 from Stage 1 will need to make up the sum difference of ￥1800 as entry fees to the event organizing party (Beijing Xingpai Sports Development Co., Ltd.) after he/she is qualified. All Chinese players are required to complete their entry and pay the entry fees via CBSA App (Entry is not completed unless the entry fee is paid through). Once the entry fees are successfully paid through, it will not be returned. Players qualified to Stage 2 from Stage 1 are required to make up the sum difference via CBSA App. Once the entry is completed on the CBSA App, players are required to click the link at the bottom of this Rules of Competition and download the entry form. Players need to fill out all necessary items marked with a * and then submit it to Organizing Committee at xingpai_star@126.com and cc to cbsa@sports.cn before the entry deadline. A.The Organizing Committee will arrange reception teams from March 12th, 2019 at Yushan South Railway Station to pick up and transfer all the Chinese players to the official hotels. B.All Chinese mainland players are welcome to check in at the official hotels from March 12th, 2019. The reception teams of the Organizing Committee will guide the players to check in, pay hotel room deposit, entry fees and fill in the registration forms. All players are required check out on the second day after elimination. The players will have to pay for the accommodation on their own if they continue to stay after their elimination. C.All Chinese mainland players in Stage 1 should arrive at Yushan and complete the registration before 12:00 March 14th, 2019, otherwise any late cases will not be accepted. D. All Chinese mainland players of the Stage 2 should arrive at Yushan and register before 12:00PM, on March 20th, 2019. A. In Stage 1, single elimination format will be applied for all matches, Man players play Best of 13, and woman Best of 9. Players take turns to kick off. B. There will be 4 divisions in Stage 1: International Man’s Division (Outside of Chinese Mainland), International Woman’s Division (Outside of Chinese Mainland), Chinese Mainland Man’s Division, and Chinese Mainland Woman’s Division. The Organizing Committee have the rights to decide the total number of qualifications in each division according to the entries on its sole discretion. 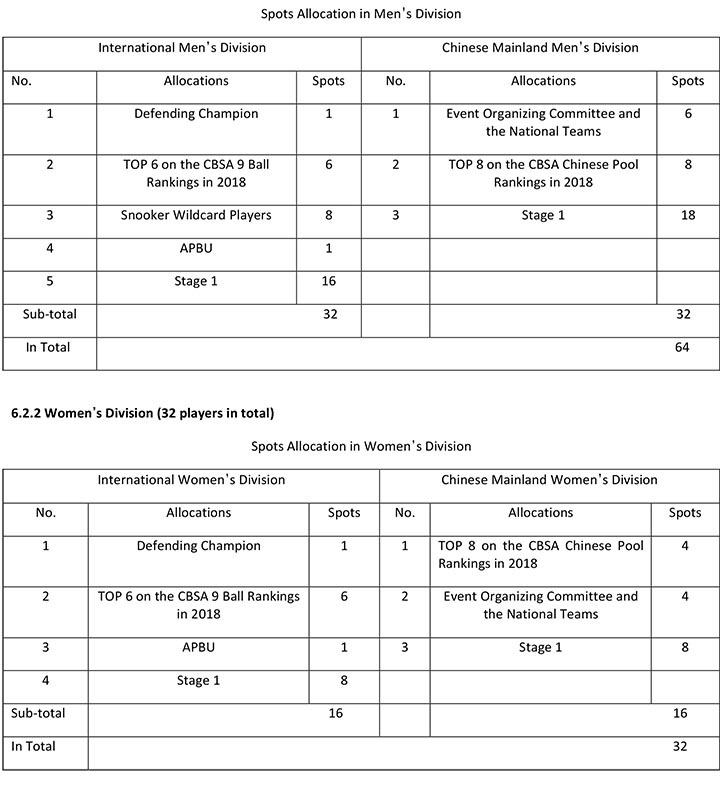 Phase 1- Top 16 Chinese men players and Top 8 Chinese women players ranking on CBSA Chinese Pool 2018 will be the seeded players in Phase 1 and the rest of the entries will make draws. There will be no seeds set for the International Divisions in Phase 1. Phase 2- There are seeds set in Phase 2 for both Chinese Mainland Divisions and International Divisions, the total number of the seeds shall be the higher-placed in the last round but lose in Phase 1. There are two phases in Stage 2. There will be 32 players in each Men’s Division and16 players in each Women’s Division, every 8 players of each Division will play in one group. Men’s Divisions will play best of 17, Women’s Divisions will play best of 13. Players take turns to kick off. International Men’s Division: 16 players will be qualified to the next round after double elimination in the Phase 1, they are 8 from the winner’s bracket and 8 from the loser’s bracket. Chinese Mainland Men’s Division: 16 after double elimination in the Phase 1, they are 8 from the winner’s bracket and 8 from the loser’s bracket. The 16 players from the two men’s divisions above will form a new group of 32 men’s division. International Women’s Division: 8 players will be qualified to the next round after double elimination in the Phase 1, they are 4 from the winner’s bracket and 4 from the loser’s bracket. Chinese Mainland Women’s Division: 8 after double elimination in the Phase 1, they are 4 from the winner’s bracket and 4 from the loser’s bracket. The 8 players from the two women’s divisions above will form a new group of 16 women’s division. Players take turns to kick off. Draw rules for DE period in Phase 1: There will be no seeded players to draw for DE period. Draw rules for SE period in Phase 2: The qualified players will be seeded according to their competition results in DE period, (A draw will be needed if the players’ records are the same), then they draw for their play procedures based on a snake shape array. The qualified players formed with the losers will draw for their competition procedures. There will be a 45 second shot clock in force throughout some of the sessions. There will be a 10 second warning issued to the player at the table when 35 seconds has elapsed, there will be a countdown for the last 5 seconds. Each player is allowed one 30 second extension per rack. There will be no shot clock at the deciding frame. Players not in play will be acting as a referee. Players will lag and rack their own balls, and record their scores by themselves. Players watch their opponents’ play and have the rights to ask the cruiser or the field referees’ judgment if they have any disagreements on any of the following shots. A timer will be used for any match not finished within the time limit. All prize money is pre-taxed. At least a rate of 20% income tax will be deducted from the prize money amount based on the applicable Chinese taxation laws. 11.2 The man and woman champions will receive a trophy, the champions and the semi-finalists will receive certificates as well as medals. 12.1 All players should wear as required by the Event Committee. Players will have to wear long sleeve collared shirts, waist coat, bow-tie, dark trousers, dark leather shoes. Players will not be allowed to play the event if their attire do not meet the dress requirements. 12.2 All players are required to dress formal suites to attend the opening ceremony, the evening banquet and draws. Players will be fined ￥1000 or $200 each time per person if they do not show up without any reasonable excuses. Players should notify the Organizing Committee in writing behand if he or she does need to ask for a leave. 12.3 All players shall not be allowed to appear on any promotional activities or participate into any commercial events without the prior permit from the Organizing Committee. Each player should wear a maximum of 4 logo patches on chest, among of which the three of the logo patches will be provided by the Organizing Committee and the fourth will be the player’s sponsor’s logo patch. The size of the logo patches will be or less than 5cmX8cm. 12.4 Players shall have to be at the check-in desk 15 minutes prior to the start time. The event staff will check the players’ clothing and logo patches to see if they meet the requirements. Players need to be at the arena entrance 5 minutes before the match starts and they will be guided to enter the arena by the referees. The chief referee has the rights to claim the abstention of the players if they fail to get to the venue after the start time. Any player failed to be in the arena after the chief referee has declared the start of the match shall be deemed as forfeited. 12.5 All objections, claims or disagreements should be raised before the next stroke if the players do not agree with the judgments made by the duty referees. Otherwise, the objections, claims or disagreements will be treated as a failure. A complaint can be presented to the chief referee if the players disagree with the decision of the referee. If the player continues to seek the judgement and make an appeal to the Arbitration Committee, she/he needs to pay ￥3500 or ￥500 as guarantee. The guarantee fee will be returned to the player if the Arbitration Committee agree with the chief referee, otherwise it will not be returned. The Arbitration Committee’s decision is final. 12.6 A warning will be received if a player intentionally disturbs his/her opponent’s play once found by the referee. A lost judgment will be given by the referee after the second time, the player will lose qualification after the 3rd time. Players who have severe violations may be forfeited from the event or receive a ban. 12.7 All players should comply with the requirements and the regulations of the Organizing Committee. Smoking is forbidden inside the venue and mobile phones are not permitted to be taken with/into the arena. Bench coaching is not allowed during a match. Alcohol abuse, drugs and any forms of gambling are strictly prohibited. It is deeply forbidden to act in violations of the Chinese laws and the ethics. Otherwise players will be forfeited from the event. 13. CBSA reserve all the rights for the final interpretation on the Official Rules of Competition. This Official Rules of Competition may not be comprehensive, any matters not mentioned herein shall be subject to the further notices of CBSA. Please click here to download the Entry Form.